Interstate 295 serves as a western bypass of Providence and Pawtucket, Rhode Island. The freeway loop had also been proposed to extend east and southward from the north end at Attleboro, Massachusetts. Rhode Island DOT will renumber all interchanges along Interstate 295 from I-95 at Warwick north to the Massachusetts border at Cumberland. Costing $340,000, the resigning commences from north to south in early November 2017 and will wrap up by the year’s end. The Rhode Island 146 freeway will be resigned in 2018, adding mileage based exit numbers to its currently unnumbered interchange array. All remaining freeways using the sequential system will be converted by 2020.1 See the Rhode Island Highway Exit Renumbering Program web page for more details. Interstate 295 is part of High Priority Corridor 60: Providence Beltline Corridor. Dan Moraseski writes that current Interstate 295 was always planned as I-295. 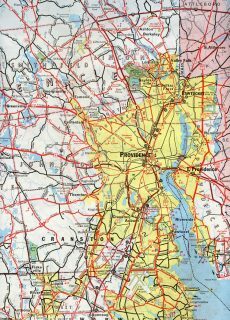 The beltway east of Interstate 95 was later changed to Interstate 895 though, perhaps when transportation officials realized it would not extend straight across I-95 at the south intersection. 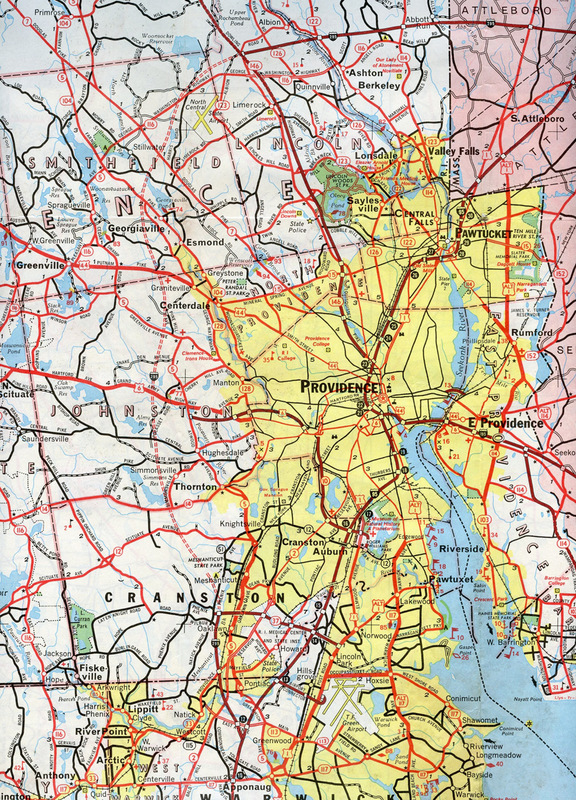 The original plan for the beltway originated along Rhode Island 37, likely at Interstate 295, and took the route east across the Providence River. From there the loop turned north along the East Shore Expressway to Rhode Island 114 and further to the north end of Interstate 295. Later it was planned to travel roughly along Rhode Island 138 and Multi State Route 136 from I-95 to I-195. Completed sections of Interstate 295 in 1969 extended north from I-95 to R.I. 37 at Cranston and west from Attleboro, Massachusetts to R.I. 146 at Lincoln. Interstate 295 ends with single lane ramps partitioning traffic for I-95 south six miles to Pawtucket and I-95 north six miles to I-495 at Mansfield. Photo taken 07/28/07. Large chevrons cover a swath of unused pavement built for the unconstructed route of Interstate 895 leading east from I-295 through Attleboro and south to I-195 between Seekonk and Fall River. Exit 2B consists of a cloverleaf ramp otherwise. Photo taken 07/28/07. Leftover from unbuilt I-895, the northbound roadway of I-295 extends a short distance beyond this set of barriers at Exit 2B. Photo taken 07/28/07. Curving southwest from Interstate 495 and the Norfolk County line, I-95 enters North Attleborough on the two mile approach to Interstate 295 at Exit 4. Photo taken 10/06/14. Exit 5 departs I-95 south for Robert Toner Boulevard one mile north of Interstate 295. Robert Toner Boulevard stems west from nearby Route 152 (Main Street) to Attleborough Falls. Photo taken by H.B. Elkins (05/13/13). Interstate 295 constitutes a western bypass of Providence, Rhode Island for travelers bound for Warwick and points south. The freeway also provides a direct route to Woonsocket in conjunction with R.I. 99 and 146. Photo taken 10/06/14. Exit 4 leaves Interstate 95 south for I-295 west to the Rhode Island state line at Abbott Run Valley. The Providence bypass meets U.S. 6 at Johnston in 19 miles. Exit 4 was realigned to improve the ramp geometry during a two-year project completed in 2017. Photo taken by H.B. Elkins (05/13/13). Advancing north from Route 123 (South Avenue), I-95 travels along side Manchester Pond to Interstate 295 south at Exit 4. Photo taken 06/26/05. One half mile ahead of the loop ramp (Exit 4) for I-295 south to Woonsocket and Warwick, Rhode Island on I-95 north near the Clifton Street overpass at Attleboro. Photo taken 06/26/05. Interstate 95 crosses Tenmile River at the half cloverleaf interchange (Exit 4) with Interstate 295. Grading remains from unbuilt ramps for the cancelled route of Interstate 895 to the east. Photo taken 06/26/05. Interstate 295 travels west from Attleboro nine miles to the R.I. 146 freeway (Eddie Dowling Highway) by Lincoln Mall. R.I. 146 forms a multi state route with Route 146 north to Worcester, Massachusetts. Photo taken 06/26/05. Southbound begin shield posted for Interstate 295. The freeway carries six lanes of traffic to the merge with U.S. 6 at Johnston, Rhode Island. Photo taken 06/26/05. Exit 2 leaves Interstate 295 south for R.I. 2 (Bald Hill Road) by Warwick Mall. Bald Hill Road intersects R.I. 113 (East Avenue) to the southwest, with East Avenue extending east to cross paths with I-295 ahead of the wye interchange with Interstate 95. Photo taken 06/26/05. An end shield for Interstate 295 precedes the off-ramp (Exit 1) for R.I. 113 (East Avenue) west. Traffic otherwise merges onto I-95 south ahead of West Warwick. Photo taken 06/26/05. Two miles south of the split with I-295 (Exit 11) on Interstate 95 north in Warwick. Photo taken 06/26/05. A second diagrammatic sign for the upcoming partition with Interstate 295 lies just ahead of the six-ramp parclo interchange (Exit 10) with R.I. 117 (Centerville Road). Photo taken 06/26/05. Interstate 95 passes over R.I. 115 (Toll Gate Road) one half mile ahead of the wye interchange (Exit 11) for I-295 north. I-295 travels 23 miles north to Woonsocket while I-95 continues seven miles to Downtown Providence. Photo taken 06/26/05. Interstate 95 maintains four through lanes at the separation with I-295 north. The freeway turns northeast toward T.F. Green Airport (PVD) while I-95 branches northwest to Cranston. Photo taken 06/26/05. The two mile guide sign for Interstate 295 north was replaced with a full sign bridge by 2005. Photo taken by Dan Moraseski (Winter 2001). The diagrammatic overhead for Interstate 295 (Exit 11) on I-95 northbound at the R.I. 3 (Cowesett Road) overpass was replaced by a new sign bridge located further north. Photo taken by Douglas Kerr (09/01). Former sign bridge along northbound Interstate 95 at the split with I-295 (Exit 11). Photo taken by Douglas Kerr (09/28/01). Paralleling the Pawtuxet River, Interstate 95 heads southwest from the T.F. Green Airport Connector one mile to Exits 12B/A for R.I. 113 and I-295 north. Photo taken by H.B. Elkins (05/31/13). R.I. 113 (East Avenue) constitutes a four-lane arterial linking Interstate 95 with R.I. 2 (Bald Hill Hill Road) to the west and R.I. 5 (Greenwich Avenue) to the east. The ramp for R.I. 113 west includes a direct connection to adjacent I-295 north. Photo taken by H.B. Elkins (05/31/13). Exit 12B separates from I-95 south for I-295 north ahead of R.I. 2 by Warwick Mall and R.I. 113 (East Avenue) west to retail areas south of the Pawtuxet River. Photo taken by H.B. Elkins (05/31/13). “Rhode Island set to renumber all highway exits.” Providence Journal (RI), October 4, 2017. Interstate 295-Rhode Island (Boston Roads). “Rebuilding roads: Major area highway projects set to begin within a year.” Sun Chronicle, The (North Attleboro, MA), June 15, 2015. Project 606733: Attleboro – Ramp Reconstruction & Realignment, from Route I-95 (SB) to Route I-295 (SB) https://hwy.massdot.state.ma.us/ProjectInfo/Main.asp?ACTION=ViewProject&PROJECT_NO=606733. massDOT web site.